Periclimenes rathbunae. Sun Anemone Shrimp. Variable, with white and red spots all over body; mostly on the back. Usually found on Sun Anemones. Here at night in Roatan 2019. Periclimenes tenuipes. Tropical Indo-West Pacific. Usually found free living (w/o commensal relation) in and amongst coral rubble. To 3.5 cm. in length. Variably red-tipped chelipeds, white line joining eyes. N. Sulawesi (Lembeh Strait) picture. Periclimenes tosaensis. Often confused with P. holthuisi which it closely resembles. Found on several hosts, most often anemones of the genus Heteractis. Here on a Euphyllia in N. Sulawesi (Lembeh Strait). 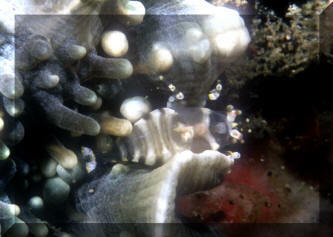 Ancylomenes (Periclimenes) venustus Bruce 1990. Easily confused with P. holthuisi (look for large white spot on abdomen on this species). 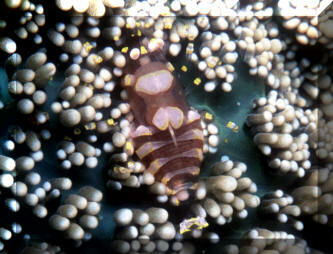 Found on anemones and hard and soft corals in shallow water (to 5 m.). At right on a Heliofungia in Mabul and N. Sulawesi, Malaysia. Below on a Stichodactyla and Plerogyra in N. Sulawesi. The latter obviously very differently marked... identification based on Debelius' Crustaceans of the World. The Spotted Cleaner Shrimp, Periclimenes yucatanicus in its host anemone, Condylactis gigantea off of Cozumel. 3/4-1 in. overall. Also found in association with other tropical West Atlantic anemones. Cozumel and aquarium images. Periclimenes sp. An unidentified species on a crinoid in N. Sulawesi. Poss. color variant of P. amboinensis, cornutus? 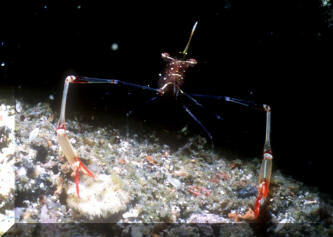 Periclimenes sp. 1 Typified by having a large white abdominal hump patch, banded red and white chelipeds, blue and white telson with red margin. N. Sulawesi pic. 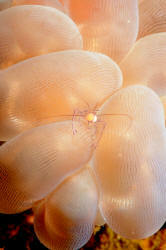 Periclimenes sp. 2. Bright white, wide, flat rostrum like P. imperator, white body chelipeds, eyes, banding like P. venustus, white antennae, white abdominal hump spot and telson, with purple highlights on uropods... you got me! N. Sulawesi pic. Pliopontonia furtiva Bruce 1973. Only species of the subfamily found in association with Corallimorphs. Body as shown, with small yellow and white spots, otherwise translucent. Indo-West Pacific; East Africa to Indonesia, Solomon Islands. N. Sulawesi pic. Pontonides or Pliopontonia sp.. This one on a Corallimorpharian. N. Sulawesi pic. Pontonides unciger Calman 1939. Body segments and coloration closely match the black/whip corals (Cirripathes) they inhabit. To about 15 mm. in length (yes, small). Indo-Central Pacific; Red Sea to Indonesia, Australia, Japan, Hawai'i. N. Sulawesi pic. Urocaridella sp., maybe U. antonbrunii. Raja Ampat 08. Clear Cleaner Shrimp. To 3 cm. Indo-W. Pacific to East Africa and Red Sea. Vir philippinensis Bruce & Svoboda 1984. Often misidentified as a Periclimenes species (including by me!). Transparent body with purple antennae, purple line running down each leg and cheliped... and only found on Plerogyra/Bubble Coral. West Pacific; Japan, Philippines. N. Sulawesi pic.